Database languages are used to read, update and store data in a database. There are several such languages that can be used for this purpose; one of them is SQL (Structured Query Language). All of these commands either defines or update the database schema that’s why they come under Data Definition language. In practical data definition language, data manipulation language and data control languages are not separate language, rather they are the parts of a single database language such as SQL. 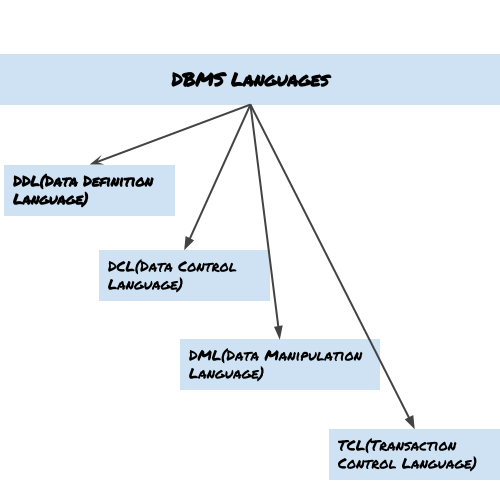 The changes in the database that we made using DML commands are either performed or rollbacked using TCL. Why SQL is taken for instance to categories DDL? Is the SQL a sub category of DDL? DDL and DML and Query Languages are the mode of database language. On the other hand SQL is the example of Database language, not a subcategory of DDL.